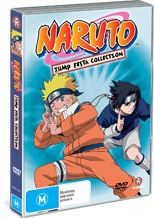 Naruto once again returns to the DVD in this exclusive collection that has never been seen on Western television. Originally seen during the Shonen Jump Festival in Japan during 2003 and 2004, this collection is truly a special treat for Western fans of the series. For those unaware of the Naruto phenomena, it revolves around Naruto Uzumaki, an adolescent ninja who hopes to be leader of his village one day, however he must first prove himself and that may be his greatest enemy yet. This hyperactive ninja almost feels like he is suffering ADD, however this is what makes the series so alive and sometimes in your face. This special collection features two never before seen episodes that include "Mission: Find the Crimson Four Leaf Clover" and "Mission: Protect the Hidden Waterfall Village" in all its uncut grace. The first episode that only contains English subtitles has our hero assisting one of this friends in finding a sacred four leaf clover to grant him the wish of his girlfriend to stay in the village. Even though the episode features subtitles, it is still quite easy to follow and is quite interesting to see the series in its native tongue. The second episode has Naruto showing the coward Shibuki how to become a hero as they are attacked by a band of rogue ninja and fortunately for those naysayers, this episode features both Japanese and English audio tracks. Even though the first episode is only in subtitles, I actually enjoyed it more than the second episode which was a little slow in parts but at the end of the day, there is no Naruto episode that is too slow. Think about that grasshopper! The DVD features good video and audio quality as one can get for mad for television animation and unfortunately the special features are quite limiting, however for fans of Naruto, it's no big deal because at the end of the day, it's anime on speed! Naruto "The Movie" Short, Extended Trailer.